Professor Abernathy works in the fields of civil rights and comparative law. He is the author of Civil Rights and Constitutional Litigation (West Publishing, 2012), the first edition of which was the first modern casebook on federal civil rights statutes. He authored or co-authored Supreme Court briefs in major civil rights cases while serving at the Southern Poverty Law Center, including the brief for Sharon Frontiero in Frontiero v. Richardson. In comparative law Professor Abernathy focuses on the philosophical and practical issues related to conceptualization of the legal process in common law and civil law countries. He specializes in teaching American law to students from foreign legal backgrounds and is the author of Law in the United States (Thomson/West Publishing, 2006), and "Law as an Item of Trade" in A Revolution in the International Rule of Law: Essays in Honor of Don Wallace Jr. (Borzu Sabahi ed., Juris Publishing, 2014). Professor Abernathy was the Fulbright Professor of Law in Egypt in 1983-84, served as director of Georgetown University Law Center’s summer programs abroad (in Florence, Italy, and Heidelberg, Germany) from 1987-2000, and often lectures at law schools abroad (Italy, Switzerland, Argentina, and Germany). 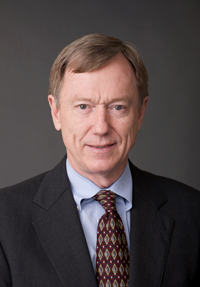 Charles F. Abernathy, Law in the United States (St. Paul, Minn.: West Academic 2016). "Apple crushed Alex Jones — then tossed him a lifeline," coverage in The Verge, August 8, 2018, quoting Professor Charles F. Abernathy. "University Students Meet with D.C. Leaders," coverage on Observer-Reporter.com, November 6, 2013, featuring Professor Charles F. Abernathy and his Civil Procedure class at Georgetown University Law Center.